. The specification is your resource for understanding what information Google needs about your products to run Shopping ads. Each year, we make updates with the goal of creating better experiences for users searching for your products online. Some of the updates require changes to your current product data that need to be implemented by September 1st, 2016 and February 14th, 2017, respectively. ‘Unit Pricing’ will be made available for all markets and applicable categories to ensure consistency in the way prices are displayed. This means, going forward, if you want to display Unit Prices, use the unit_pricing related attributes and not the price attribute. Learn more. ‘Color’ and ‘size’ values submission will be enforced more strictly for apparel products in Germany, France, Japan, and the UK. Complete and consistent data for variant attributes provide a better shopping experience for users. This means, going forward, not providing ‘color’ and ‘size’ values for apparel products in Germany, France, Japan, and the UK, will result in item disapprovals. Learn more about 'color'. Learn more about 'size'. ‘Gtin’ and ‘google product category’ requirements will be expanded to Austria, Belgium, Canada, Denmark, India, Mexico, Norway, Poland, Russia, Sweden, and Turkey to improve product matching and overall ad performances. This means, going forward, Global Trade Item Numbers (GTINs) are required for all products with a GTIN assigned by the manufacturer. GPC is required for all products falling within the 'Apparel & Accessories', 'Media', and 'Software' categories. Not providing values for the ‘gtin’ or ‘gpc’ attributes will result in item disapprovals. Learn more about Google product categories. Learn more about GTINs. The minimum image size requirements for non-apparel products will be increased from 32 x 32 to 100 x 100 pixels to be able to support new ad formats better. The minimum image size for apparel images will remain 250 x 250 pixels. Ads with large, high-quality images (we recommend 800 x 800 pixels or larger) have proven to be more effective and lead to better performance. This means, going forward, non-apparel images below 100 x 100 pixels and apparel images smaller than 250 x 250 pixels will result in item disapproval. Learn more. The maximum feed file size will increase from 1 GB to 4 GB (Gigabyte). As before, files can either be submitted in compressed or uncompressed format. Learn more. Beginning September 1st, 2016, all of the updates, except the GTIN requirement updates, will go into full effect and any product data that doesn't meet the requirements in the Products Feed Specification will be disapproved. Since providing accurate GTIN information can take more time in expanded countries (Austria, Belgium, Canada, Denmark, India, Mexico, Norway, Poland, Russia, Sweden, and Turkey), the GTIN requirement updates will go into full effect later on, starting February 14th, 2017. As you begin making updates to your product data, we also recommend that you update the corresponding microdata on your product landing pages, which helps to ensure a strong match of information between your ads and your website. Additionally, this allows you to take advantage of advanced features such as automatic item updates, which ensure that your ads have the most accurate price and availability information. 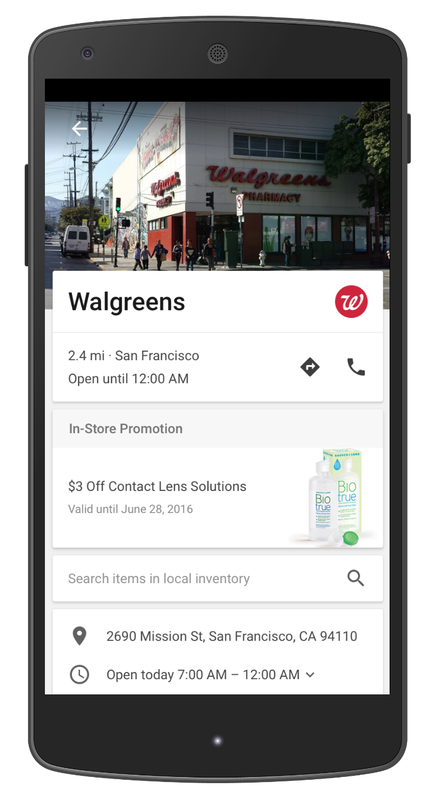 Today, we’re announcing updates to the Google Shopping Products Feed Specification. The specification is your resource for understanding what information Google needs about your products to run Shopping ads. Each year, we make updates with the goal of creating better experiences for users searching for your products online.
. And across the millions of websites using Google Analytics today, we're seeing more than half of all web traffic now coming from smartphones and tablets. When we asked people to describe the role smartphones play in their lives, they used phrases like "attached to my hip", "butler" and "lifeline." Smartphones have become the companion that people turn to in I-want-to-know, I-want-to-go, I-want-to-do and I want-to-buy moments throughout the day. To help marketers succeed in this mobile-first world, we have redesigned AdWords -- from the ground-up -- and re-thought everything from creatives and bidding, to workflow and measurement. We’re also making it easier for marketers to bridge the digital and physical worlds. With location-related mobile searches growing 50% faster than all mobile searches, it’s clear that consumers are moving seamlessly between online and offline experiences. So it’s important to help marketers think this way too. It was incredibly exciting to share new innovations with advertisers this morning at the Google Performance Summit. Below are highlights from today’s announcements. You can watch a replay of the full program here. Over the last several years, we’ve discovered that accounting for mobile and designing for mobile-first are two very different things. That’s why we’ve completely transformed how we think about and build AdWords. In order to enable advertisers and developers to drive more downloads of mobile apps -- across Google properties -- we built Universal App Campaigns. To date, Universal App Campaigns has delivered more than 2 billion downloads for advertisers, across Google Search, Google Play, YouTube, and the Google Display Network. And last week at Google I/O, we announced this campaign type is now available on iOS. Today, we are announcing even broader changes to advertising with Google, from how text and display ads work, to the way advertisers optimize campaigns. What do text ads look like in the mobile-first world? Mobile has revolutionized the canvas where ads live. Earlier this year, we removed right-hand side ads on desktop to improve the search experience and make it more consistent across devices. This paved the way for us to introduce the biggest changes to our text ads since AdWords launched fifteen years ago. These upgrades help your ads work harder across screens, especially for the on-the-go mobile consumer that wants to know exactly what you offer before tapping into your website. Based on early testing, some advertisers have reported increases in clickthrough rates of up to 20% compared to current text ads. We encourage you to start planning for this upgrade before it rolls out later this year. How do display ads look in a mobile-first world? From sites to apps to videos, mobile has unlocked a universe of new spaces to reach consumers. Responsive ads for display adapt to the diverse content across the more than two million publisher sites and apps on the Google Display Network (GDN). They also unlock new native inventory so you can engage consumers with ads that match the look and feel of the content they’re browsing. Simply provide headlines, a description, an image, and a URL -- and Google will automatically design these beautiful responsive ads. Responsive ads for display adapt to fit any app or site on the GDN. What does bidding look like in a mobile-first world? Marketers need more control and flexibility to optimize bids on specific devices. In the next few months, you’ll be able to set individual bid adjustments for each device type -- mobile, desktop and tablet. This lets you anchor your base keyword bid to the device most valuable to your business and then set bid adjustments for each of the other devices. You will also have a wider range to adjust bids, up to +900%. With more controls, you can now optimize with greater precision while keeping things simple with a single campaign that reaches consumers across devices. Nearly one third of all mobile searches are related to location. People’s online and offline worlds are colliding — whether you’re researching restaurant ideas for dinner on Friday night or looking for a store that sells rain boots in your size. 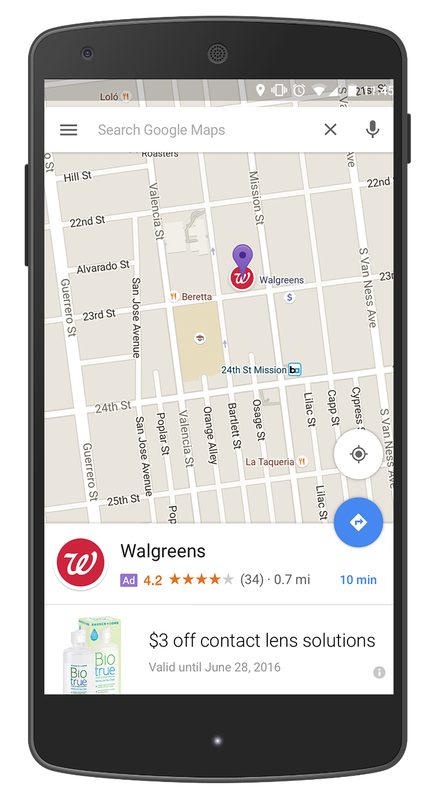 We’re also investing in more branded, customized experiences for businesses on Google Maps -- geared towards helping you increase store visits. We’re currently developing and experimenting with a variety of ad formats on Maps that make it easier for users to find businesses as they navigate the world around them. For example, Maps users may start to see promoted pins for nearby coffee shops, gas stations or lunch spots along their driving route. Local business pages are also getting a brand new look -- to encourage consumers to explore your store before they even arrive, we’re adding new features like special offers and the ability to browse product inventory. With online ads bringing more people to your storefronts, how do you measure the impact? AdWords is the largest online-to-offline ad measurement solution in the world. In fact, since AdWords store visits were introduced two years ago, advertisers have measured over 1 billion store visits globally. Businesses across a variety of industries around the world are using insights from AdWords store visits to measure the impact of online ads on offline activity. Nissan UK discovered that 6% of mobile ad clicks result in a trip to a dealership, delivering an estimated 25x return on investment. See the full story here. As consumers live their lives online and blur the lines between online and offline, it’s more important than ever to build your business for mobile. Google’s building for this mobile-first world as well and we’re excited to go on this journey with you. To see the full range of ads and analytics innovations announced this morning, watch the Google Performance Summit keynote here. Also check out the new AdWords Marketing Goals site to learn how to use ads solutions to meet your business objectives. Every year, there are trillions of searches on Google and over half of those searches happen on mobile. And across the millions of websites using Google Analytics today, we're seeing more than half of all web traffic now coming from smartphones and tablets. Welcome to the Google Performance Summit livestream! Tune in at 9AM PT/12PM ET to hear Google’s latest mobile-first innovations, the moment they’re announced. Join the conversation at #GoogleSummit. In today’s crowded market for mobile apps, it’s more important than ever to be able to attract the right users to your app, gain their loyalty, and drive long term value. A new analytics platform called Firebase Analytics that can help you to understand and optimize for lifetime value. To help prepare for these updates, we’ve updated two of our best practices guides that will help you use AdWords for driving more app downloads and increasing user engagement. You can also check them out at g.co/PromoteYourApp. Only 364 days left to the next I/O! with the launch of Universal App Campaigns - one simple campaign that surfaces apps to billions of consumers who use Google Play, Search, YouTube, and more. 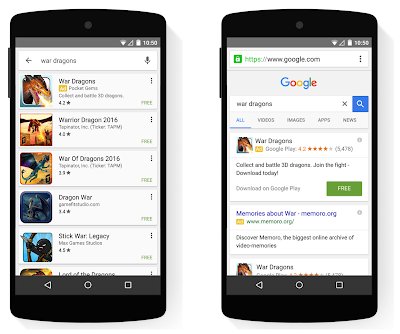 It’s working, and more people are discovering apps on Google than ever before. Over the past year -- and thanks to Universal App Campaigns -- we've more than doubled the volume of app installs driven by ads, and to date we’ve delivered more than 2 billion downloads to developers. Today at Google I/O, we’re announcing multiple improvements to Universal App Campaigns to make it an even more powerful tool for app developers to find the right users for their app. First, Universal App Campaigns are expanding beyond Android to help developers grow their iOS apps. Now, all app developers can tap into the simplicity and power of Universal App Campaigns to reach billions of Android and iOS users on YouTube, the Google Search App, and the Google Display Network. Universal App Campaigns for iOS are available in beta today and will roll out to all developers in the near future. Second, we’re helping developers more easily grow an active user base by finding the right user from the start. Instead of reaching any user to install their app, developers can now also find customers who are likely to be valuable users of their app. A recent study1 showed that 17% of users drive 85% of app revenue, which is why successful apps are shifting their focus from volume to finding more of the right customers. Universal App Campaigns will automate targeting, bidding, and creative generation to find your most valuable users based on your in app conversions. Just tell us the in app events that matter to you, whether it’s reaching level ten in your game, subscribing to your service, or making a purchase in your app, and we’ll do the rest. Our models evaluate countless signals and constantly learn and adjust, meaning every ad is based on the freshest, most relevant data. The best thing is that we do all the hard work in the background, predicting which users will be valuable and acquiring them at the right price. These innovations are in testing and will roll out in the coming months. "Universal App Campaigns have helped us acquire users with a higher LTV compared to other acquisition channels. We're particularly excited about how the next generation of Universal App Campaigns will enable us to iterate quickly and optimize for the actions that matter most to our business. This is an app marketer's dream." That’s not all. We’re creating more chances for developers to show ads where users go to watch, discover, and communicate. 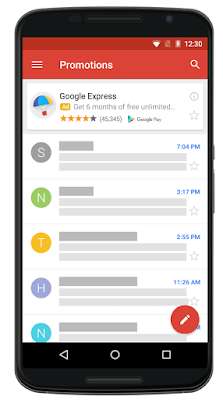 Universal App Campaigns will soon reach more users on YouTube, as well as introduce a new opportunity to reach users on top of tabs in Gmail. 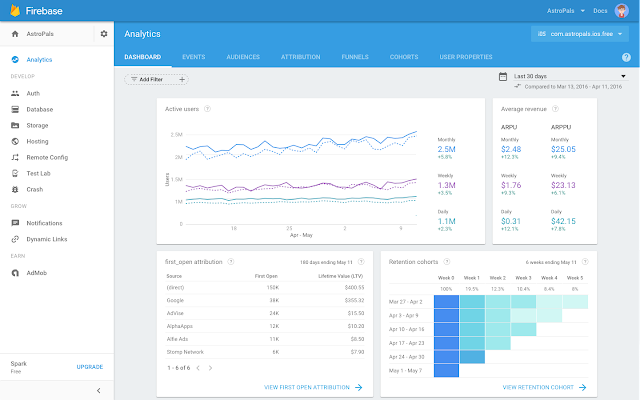 Finally, we know app developers need the best user insights to build better apps and power their marketing campaigns, so we’re particularly excited about Firebase Analytics, our new analytics platform designed for apps from the ground-up that was announced at Google I/O earlier today. It provides prebuilt engagement and in-app actions that will help manage your conversions and lifetime value for AdWords campaigns and over 20 third-party ad networks. If you’re an AdWords user you can funnel these conversions into AdWords so it’s even easier to optimize campaigns to the things you care about. We look forward to helping many more developers build and grow successful businesses. At Google I/O, we’ll be sharing essential insights and best practices on how to drive growth with Google tools. You can take part too by viewing the live streamed and recorded sessions here. Happy I/O! Last year at Google I/O, we shared our mission to make app growth easier with the launch of Universal App Campaigns - one simple campaign that surfaces apps to billions of consumers who use Google Play, Search, YouTube, and more. 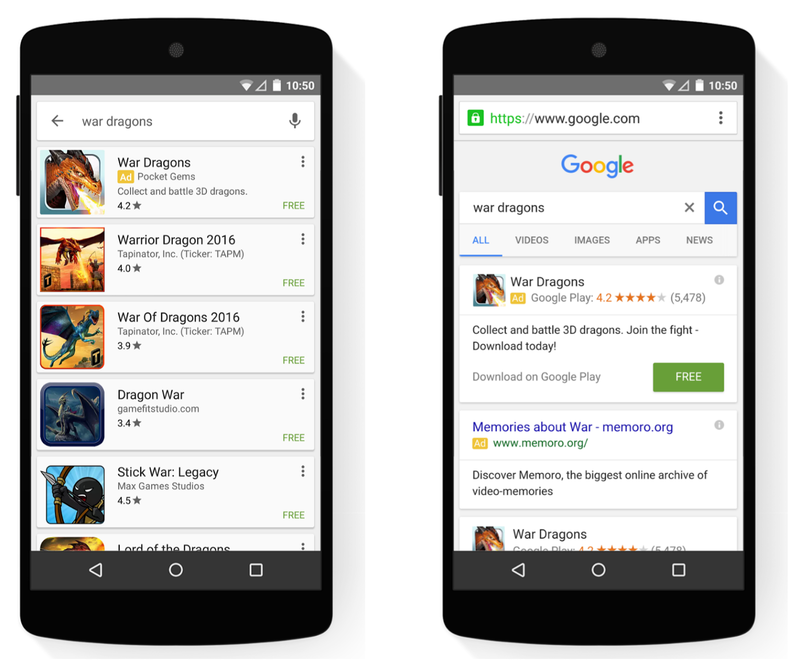 It’s working, and more people are discovering apps on Google than ever before. Over the past year -- and thanks to Universal App Campaigns -- we've more than doubled the volume of app installs driven by ads, and to date we’ve delivered more than 2 billion downloads to developers. That’s why we are introducing Shopping ads on image search. Now your ads for related products will appear as shoppers browse Google Images, so they can easily click through to buy from you. Brands like Swarovski are excited about this new visual format. Your ads are automatically eligible to show on image search as part of the Google Search Network. Searches with local intent - those that include a place name or zip code, or words like “near me” - have doubled in the past year.4 We introduced local inventory ads to help make the inventory in your local stores accessible to people shopping online. This format has been incredibly effective for shoppers and retailers, and we’ve shown them four times more to people looking for local products in the last year. Starting today you can show people that you offer buy online pickup in store by adding a store pickup link to the Google-hosted local product page. This is the page that appears after a user clicks your local inventory ad. Kohl’s, a participant in our Store Pick-up pilot program, saw a 40 to 50% increase in clicks from their Google local storefront to the Kohl’s site with this feature. For advertisers who use local inventory ads, we’re also making your inventory searchable on Google.com in the local Knowledge Panel, a place where shoppers already look for store hours and directions. Together these updates will assure shoppers that what they’re looking for is in stock, bringing more of them into your stores. Google Express continues to drive value for retailers by helping them sell their inventory online and particularly on mobile – with our mobile app accounting for over 50% of orders. Over 50% of customers brought to retailers by Google Express are new.5 And sales from retailers’ existing customers have grown by 18%.5 On the back of this success, we continue to roll out our overnight delivery service. In June, we’ll launch to over 23M people in Texas and parts of surrounding states, increasing Google Express coverage to over 120M people. Last July we launched Purchases on Google. This feature of Shopping ads allows people to easily buy products on mobile through retailer-branded product pages hosted by Google. Ralph Lauren, UGG, Staples and more of our top advertisers have been testing this feature and seeing strong results. That's not only good for retailers, but also for shoppers who are more easily able to purchase on the go. According to John Kalinich, Senior Vice President, Global Digital Commerce at Deckers Brands, "It's early days, but we're seeing a nearly 50% increase in conversion rate on our mobile Shopping ads with Purchases on Google and a 25% decrease in our cost per conversion for UGG." Staples has seen similar results. “We've added 95% of our products to the Purchases on Google program and within less than a year, we've already seen an improvement in ROAS, compared to mobile shopping ads” says Faisal Masud, EVP of Global E-Commerce at Staples. As mobile’s role in shopping continues to grow, being there and being useful to people in their “I need some ideas,” “which one’s best?” and “I want to buy it” micro-moments will drive more online and store sales. Please talk to your Google account team if you’re interested in trying any of these features. 1. Google Data, Aggregated, anonymized data from Google Analytics for US retailers, U.S., April 2016. 2. Google Data, Aggregated, anonymized mobile searches that are eligible for a Product Listing Ad, Global, May 10, 2015 - May 9, 2016. 3. Google/Purchased Digital Diary: How Consumers Solve Their Needs in the Moment, May 2016, Smartphone users = 1000. Search and purchase on smartphones weekly = 736. Shopping features include the following: Engage with advertisements or messages from a business (click, watch, etc.) Check product availability online or instore, Read reviews from other shoppers and experts, Watch online videos about the product or service, Look at product images for the product or service, Use discounts or offers for a product or service, Contact a store about a product or service, View store locations on a map. 4. Google Trends, U.S., 2015 vs 2014.
a series of protections across mobile web and mobile apps to prevent accidental clicks like these on ads. Today we are continuing this commitment to protecting users and advertisers by extending accidental click protections to native ad formats. Native ads were developed to help publishers and developers implement ads that complement the look and feel of their content. Since our teams started instituting various click protections, we’ve learned quite a bit along the way. Here are two insights among many that guide our ongoing work. A professional baseball player has about 680ms1 to react and swing at a baseball thrown at 90mph. That’s fast, even for a professional who’s paying close attention to hitting the ball. We think it’s virtually impossible for someone to read, understand, and take action on an ad in that amount of time. Not surprisingly, we found super-fast clicks on ads to provide little to no value to advertisers. That’s why we ignore fast clicks that we detect to be accidental immediately upon ad load. Rather than our ads causing surprise low quality clicks, users can continue on uninterrupted. If you’ve used a mobile device, you know fat-fingers are a reality of touchscreens: the average fingerpad is roughly 50px large when pressing down.2 When we’re swiping, pinching, and poking our screens, it’s easy to accidentally touch the edge of an ad that appears unexpectedly or is placed too close to tappable controls on your screen. When we compared the performance of clicks from the edge of ads to those coming from the interior region, we found dramatically higher conversion rates and user intentionality on clicks toward the middle of ad units. A few years ago, we started to expand these protections across mobile placements resulting in ad clicks that are more intentional. Fast clicks and edge clicks are just two of the user interaction issues we prevent in order to deliver value to advertisers. By expanding protections like these to native ad formats on mobile, we observe conversion rates increase over 10% on average with minimal impact to long term publisher revenue. This combined with our previous efforts has greatly improved the experience with mobile ads for users and advertisers. The protections we’ve put in place across mobile web and mobile apps prevent tens of millions of accidental clicks per day, saving users tens of thousands of hours. When we look at the effect for advertisers in mobile apps, we observe double the value per click. We work hard to ensure that the clicks advertisers are charged for are more meaningful, and we hope sharing insight on these protections helps raise awareness and guide the wider advertising ecosystem. Plus, we really love playing games on our phones too, and want to make sure that we’re only taken to an advertiser’s page when we mean to go there. We’ve all been there. You’re trying to send an article from your phone to a friend, or you’re playing a mobile game while waiting in line for a movie, when you accidentally touch an ad on your screen. You weren’t interested in the ad -- heck, you didn’t even have time to see what it was for -- but now you’re hitting the back button to get back to what you were doing. Not only do accidental clicks like these annoy users, but left unaddressed, they can drive down the value of ads. Over the last four years, we’ve introduced a series of protections across mobile web and mobile apps to prevent accidental clicks like these on ads. Today we are continuing this commitment to protecting users and advertisers by extending accidental click protections to native ad formats. Native ads were developed to help publishers and developers implement ads that complement the look and feel of their content.